Hatchet are a four-piece thrash metal band from San Francisco, California, that formed in 2006. They have released two albums to date with Awaiting Evil in 2008 and Dawn Of The End in 2013, and after the tour for Awaiting Evil, singer/guitarist Julz Ramos had to completely rebuild his band from the ground up. Hatchet will be performing Saturday, June 21, at Trenton, New Jersey’s Championship Bar And Grill with Black Tide, Threat Signal, Affiance and Paralysis. 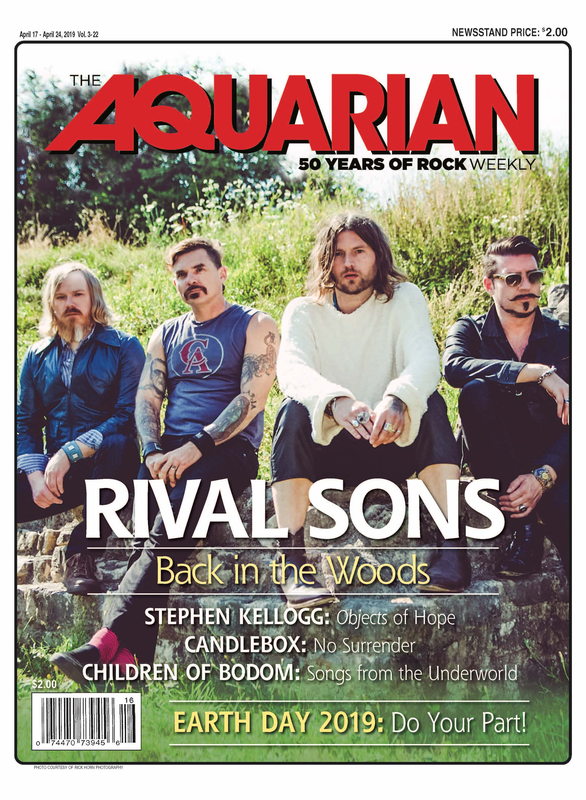 The Aquarian Weekly recently caught up with Ramos to discuss Dawn Of The End, touring, and what it really means to be signed to a label. Having five years between Awaiting Evil and Dawn Of The End, how many songs did you go through to pick out what ended up on the new album? I am the sole songwriter of the band and actually, I didn’t really dispose of any songs in between. I knew at some point I was going to record it. A lot of the songs I had written closely after Awaiting Evil. Lineup changes, trying to stay afloat, performing live shows and doing small tours got in the way of being able to write more. The songs are ones that I had written from beginning to end with that intention. I remember hearing “Signals Of Infection” back in 2010 on the tour with Witchaven. How much did you change it up since then? Honestly, not very much. A couple of chords here and there, a couple different guitar nuances… Some of the vocal lines did change because at that time I was new to singing. I hadn’t found my voice yet and what I am strong with and what sounds good. At that time it was just monotone kind of punkish singing. There were a lot of words in that song so I streamlined a little bit more in the verses to make it easier for the way I sing now. For the most part it’s pretty much the same, besides little tweaks like that. Can you explain how prevalent pay-to-play is in Southern California and Bay Area clubs, and what kind of venues you would point to for underground musicians that are rising up to get themselves booked at? Hatchet is never going to be a pay-to-play band where we hand over cash just to go over a stage, but we sold a few tickets here and there. There are venues around that still want to do that; there are a few key promoters in the Bay Area that want to do that. I think it’s fine if it’s the $15-20 ticket range as opposed to selling 50-75 tickets where you basically are buying the band’s guarantee that is going to be on that night. I think there is a point where it is OK, and a point where it is not. We definitely have gotten really big offers for shows where it wasn’t OK and I turned it down because I am not willing to pay for another band’s guarantee out of my own pocket to play on a stage. That’s not what it is about. You have toured America on three previous DIY tours. What type of things did you realize you should have done on the first tour that you learned by the end of the third tour? I should have fired everybody I had in the band back then and got the guys I had in the band now (laughs). The biggest thing is learning to get along with the people that you are with. You need to choose the battles you fight with the little things that get on your nerves. So far this lineup that we have now has been better than any other lineups we have had. I never imagined in my life that I would be doing vocals. Midway through our tour with Havok back in 2009 or 2010, we had to kick our singer out of the band on tour. You don’t quit, you find a way to do things. If your vehicle breaks down, you put the money into it, and worry about the finances later. If your singer quits or you fired him, what are you going to do? I’m the sole ranger of the band; I raise my hand and say, “I’m going to do it.” That’s what I had to do. It’s not easy but it is what you have to do. You learn to adapt to what being on the road means. What have you noticed about the prevalence of pay-to-play venues from your years on the road? For the most part I don’t see it, and that’s a good thing. It just depends on the promoter if it’s like ticket selling, when you have to give $1,000 and you can play. I would never recommend anyone doing that. If you know that as a local you have enough time to get your people in the door do it, sell 15, 20, 25 tickets and you know you are not going to go out of pocket, do it. It’s a way to promote your band and other bands on the show. If you are being asked to cover a tour package guarantee where you sell 70 tickets for $20, are you comfortable with paying $1,000 or $2,000 to play a show? I’m certainly not. How important is it today for a heavy metal band to be signed to a label? And what does it mean for a band that has survived the DIY route for a few years to get signed? That’s kind of a double-sided question. As far as being on a label, it can really hurt you and it can really help you. We were always just a band trying to play in our local Bay Area scene. Suddenly bands like Warbringer, Fueled By Fire happened. Labels were picking people up left and right. It’s a learning experience. I am glad I went through it. The label we are on now, The End Records, it’s a night and day difference. They are a smaller label. They are indie-based. They truly 100 percent communicate with us. They work with us. They work for us, which is what a label is supposed to do. They showed up to our New York show and their president even came out. They printed us up flyers. They gave us tour support, which is unheard of in these days. It’s a total night and day difference. Unfortunately, it is not about how good you are. In this case, it was, though; they liked our album Dawn Of The End a lot. They wanted to take a chance on us and they really believed in it. They came out to our show in New York and supported us 100 percent. They gave us tour support and in this day and age, that’s really unheard of. We lucked out this time around and we could’ve easily given up when the band basically crumbled and I was basically the only member left standing. For some reason, I had an urge to keep it going. The second album is way better, with a better lineup, and the label makes sense this time. Labels still help in this day and age. Bands like to do it themselves. They like to sell their own albums and get the money, which I am not about because I can do a DIY tour and sell 200 copies. Oh, I made $2,000, or I can see it as an investment in the end and realize I am not going to make a cent off any of these albums, but we will eventually end up getting on good tours with good promotion to get the band where it needs to be. One day we may see some money from it but if you are in this business for money, you are in the wrong business unless you get really lucky or are in this for years and you tour a bunch with no money, and you might be able to look forwards to McDonald’s or something. It’s all luck. That’s the truest answer. Hatchet will be performing Saturday, June 21, at Trenton, New Jersey’s Championship Bar And Grill. Their latest album, Dawn Of The End, is available now through The End Records. For more information, go to facebook.com/hatchetofficial.